Emma is a princess escaping a boring prince-suitor by running to the swamp when she stumbles upon a talking frog. Claiming he is an enchanted prince who needs a kiss to return to his human state, the frog asks Emma to help him. Reluctant at first, Emma complies and instead of turning the frog into a prince, she turns into a frog. The two frogs embark on an adventure to return to their normal human selves. 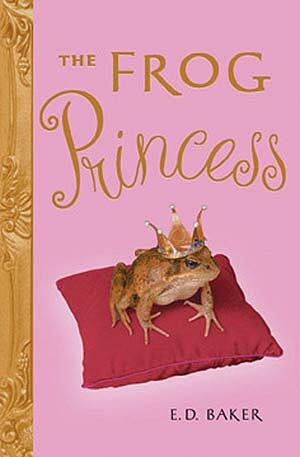 The prince-frog needing a kiss from a princess is a classic story. The twist of Emma turning into a frog is a nice touch, but I was somewhat disappointed with this story. I think it's more of a juvenile or tween book than it is a teen book. I may have it classified incorrectly... there wasn't anything "wrong" with it, the writing was okay, it just felt like a teen book would have been a little deeper. I think tween girls will love this book. It's a fairy tale with a fun twist. It's easy to read and has the appropriate amount of adventure, romance and magic. Love your blog! I have to read this book. I'm a librarian at a library for the blind in Arizona. Where and when does this story take place?